Calendars play a vital role in our life, checking from day and dates to letting us know about holiday, it helps us to effectively plan out life. Companies are capitalizing on this utility and are using calendars to promote their business. There are different types of calendars that are available like poster calendar, desk calendar, wall calendar, card calendar etcetera. Talking from a business point of view Wall Calendars are magnificent. You can get them printed in different sizes, with your company’s name, logo and address on it along with beautiful pictures. You can further add quotation, motivational words, or punch lines to make it more attractive. Quality of paper, good pictures and great printing quality are the essentials for a wall calendar to have that desired impact on the viewer. S S Graphics have wall calendar printing facility. 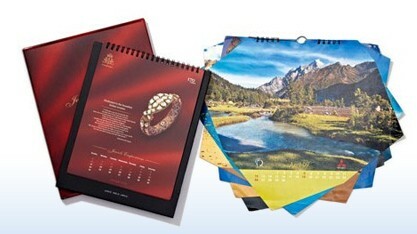 We print these calendars in various size and alluring designs. The wall calendars will adorn your living room or office. Numerous people would be seeing it, so quality has to be supreme. We use premium quality material for printing calendars, so you get a rich and classy look that will captivate the onlookers. At S S Graphics , we use the latest printing technology and advanced printing equipment, so it cuts down the printing cost without any compromise on quality, thus allows us to offer our client printing solution at a very competitive price. Get your wall calendars printed today and make a place in the walls as well as the heart of consumer. Fully Customizable size calendar printing. Turnarround Varies According Nature and Quantity of the Job. Wall Calendars Printing is Easy! Printing Calendars are very powerful marketing tools that lets you hang with your customers all year and will keep your business at the forefront of your customers’ minds all year round. Poster and wall calendars can be highly-effective in promotional marketing when designed with aesthetically pleasing images and layouts making them even more attractive. S S Graphics has calendar printing equipment with lots of size and paper type options. You can use calendar printing in advertising in a variety of ways. Size : Choose an Option... 8.5" X 11" 9" X 14" 11" X 11" 11" X 17" 14" X 19" 17" X 24" 19" X 28"